Late in 2014, the organizers of the Sioux Falls Half and full Marathon announced that there would be major chances to the race for 2015. I not so silently cheered. If you've followed my blog for any time, this is the first half I trained for and raced in 2005 and have run it every year since then. I've made it very clear that I hate the route evolution and wished that it would go back to the route it was previously. Last week, the organizers announced that the half marathon race would be a loop race course experience that would start and finish at Howard Wood field, hopefully providing a bigger finish experience for runners. From what I can tell based on the race route map in comparison to my garmin maps from previous races, the first seven miles will revert back to my favorite race course route (yay!) 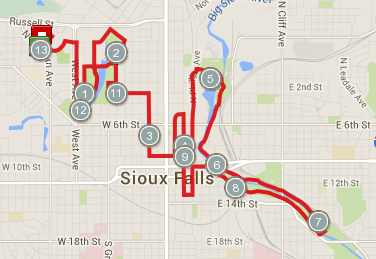 and then at mile 7 will deviate into something completely new. This does mean there will be a new set of challenges in the form of an uphill around mile ten, but anything is better than the thrasher of a concrete aggressive downhill that we used to have to suffer through at mile 9, causing major leg seizing for the last few miles. Barf. As for the marathon, I had previously vowed to never do the full marathon. It was on a part of the bike trail that I generally avoid for long runs because there is little to no tree cover, meaning there's no protection from sun or wind. There is never a day that goes by that we don't experience excessive amounts of one or the other! I also had some strong opinions about the bike trail that this race sent runners on. From experience, there were parts of the trail that had significant grade issues. I have enough hip and knee problems without running on significantly uneven concrete, thanks. Based on the race map, they made significant changes to that as well. The marathoners will take the same route as the half marathoners for the first seven miles, and then they'll break off and venture on their own way. Around mile 15 they'll meet back up to the bike trail which will be a nice flat final 11 miles for them. Hopefully some spectators will be out cheering them on because the bike trail can get kind of lonely otherwise. Additionally, the race route times have adjusted slightly, the marathon from 6:45am to 7:00am (pray for a cool day!) and the half marathon has shifted from 7:30 to 7:10am (yayzies!). The price has also increased, but you won't hear me complain about that, as I always bragged to anyone and everyone what a great race value you got for a $35 early entry fee! A $10 increase per registration cut off is nbd, especially for how well this race is put on (again my only beef prior to this year was a less than desirable race route in parts). My buddy Matt wrote this great article prior to the race route announcement. Check it out, as it features some great local runners opinions! 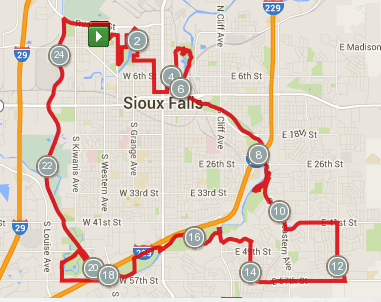 Running is alive and well in Sioux Falls! For anyone looking for race reports from the race before the route changes I have them here: 2009, 2010, 2011, 2012, 2013 (ran but didn't recap, oops! ), 2014. 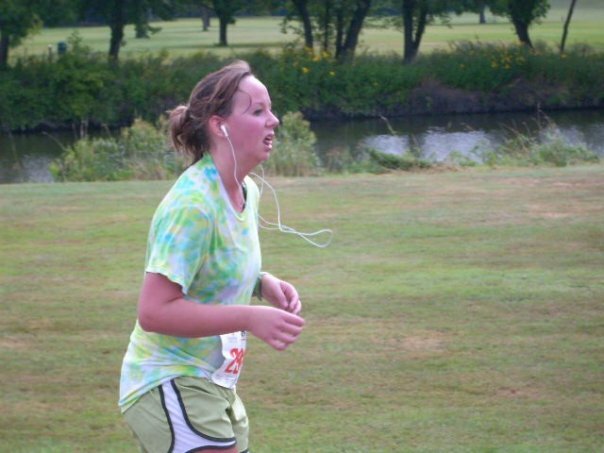 Lolz, this was from the race in 2006 or 2007, and is my favorite running photo EVER.